Welcome to the Lake Clark National Park Information Page. The closest major airport is Anchorage, AK with smaller airports at IIiamna, Kenai and Homer, AK. Access to the Lake Clark region is by small aircraft. Float planes may land on the many lakes throughout the area. Wheeled planes land on open beaches, gravel bars, or private airstrips in or near the park. There is no highway access to the park and preserve. A one to two-hour flight from Anchorage, Kenai or Homer will provide access to most points within the park and preserve. Scheduled commercial flights between Anchorage and Iliamna, 30 miles outside the boundary, provide another means of access. Lake Clark National Park and Preserve is open year round with the highest visitation June through September. The area can be divided into four distinct physiographic realms: the Cook Inlet coastal region, the Alaska-Aleutian mountain ranges, the foothill and lake region, and the tundra plains region. The coastal region, from Tuxedni Bay south to Chinitna Bay, is formed where the mountains plunge almost directly into the Inlet. The precipitous coast is deeply incised with U-shaped glacial valleys and fjord-like coves. The heads of the coves along here are generally choked with sediment washed down from the uplands. The Alaska Range joins the Aleutian Range at the north of the park to form the dominant feature of the park – the Chigmit Mountains. These are rugged mountains carved by glaciers and frost action with deep river canyons between them. There are three active volcanoes in or near the park – Mt Spurr (11,070 ft) to the north, Mt Redoubt (10,197 ft) and Mt Iliamna (10,016 ft) in the park. The volcanic history of this area has certainly had great influence on its cultural and ecological history. West of the mountains is a region of foothills and terminal moraines. Behind this band of moraines lies a series of lakes, smaller in the north of the park and culminating with the 110-square-mile Lake Clark. These lakes, and the rivers leading from them have very high potential for cultural resource occurrence. The foothills region gives way on the west to the tundra plains. Rivers through this area become meandering and slow, and much of the surface water is trapped in a myriad of poorly-drained ponds and small lakes. This area supports moist tundra, sparse stands of black spruce, and large populations of caribou, moose, birds, and fish. There are major river systems running through and from the park. The most important of these river systems is the Kvichak River, which hosts one of the largest sockeye salmon runs in the world. Prehistorically and historically this, and other, salmon runs formed the subsistence and economic backbone for the residents of this region. The third cultural element of the prehistory of Lake Clark National Park and Preserve, the Dena’ina, is the least well known archeologically. Inland Dena’ina, the late prehistoric and historic inhabitants of the Lake Clark area, are a branch of the much larger Athabaskan people. The origins of the Athabaskan groups can almost certainly be traced back to northeast Asia and Siberia but these early migrants have not been pinpointed at any archeological sites in Alaska. However, linguistic research has shed some light on the prehistory of the Athabaskans, despite the difficulty of correlating linguistic and archeological data, especially as it relates to group and ethnic identity. Following Captain Cook’s 1778 explorations of Cook Inlet, Euroamerican contacts steadily increased. Navigators visited and traded with the coastal Dena’ina toward the close of the eighteenth century, and the Russians established settlements and trading posts along the Kenai Peninsula as part of the fur trading activities. Some evidence suggests that the Russian Bocharov may have reached Iliamna Lake in 1791 and perhaps established a small and temporary trading station in that area. This period was marked by unfair dealings and mismanagement by the Russians. The Lake Clark people were in contact with their Cook Inlet relatives (and possibly with their Yupik neighbors to the west on Bristol Bay). During the period of Russian hegemony in Alaska, missionary activity by the Russian Orthodox Church was widespread. Kijik shows evidence of this activity since the remains of a Russian Orthodox church has been documented. Below are some interesting facts about the wildlife in Lake Clark National Park and Preserve. One of the special things about Lake Clark is that there are a variety of animals living in the park. Visiting the park one could see sea otters, whales, harbor seals, grizzly/brown bears, caribou, wolves, black bear, wolverines, moose, lynx, Dall sheep, salmon, eagles, spiders, and many, many more. They all have distinctive characteristics you will find fascinating. Lake Clark National Park and Preserve helps protect all these animals similar to National Parks in the Lower 48. In the Lower 48 you are not allowed to hunt in National Parks. However, in Alaska, many of the National Park areas also have an adjoining “Preserve” piece associated with it (Lake Clark National Park and Preserve). The law establishing the Alaskan parks and preserves allows for hunting and trapping in those preserve segments, while extending national park protection to the land. The Preserve is an area where anyone with a State of Alaska hunting permit may hunt. People hunt caribou, moose, Dall sheep and bear in Lake Clark Preserve. Most National Park Service buildings and local visitor services, facilities, and air charters are not handicapped accessible. Fishing vacations at various lodges; backpacking and camping for a week at remote lakes; river float trips. 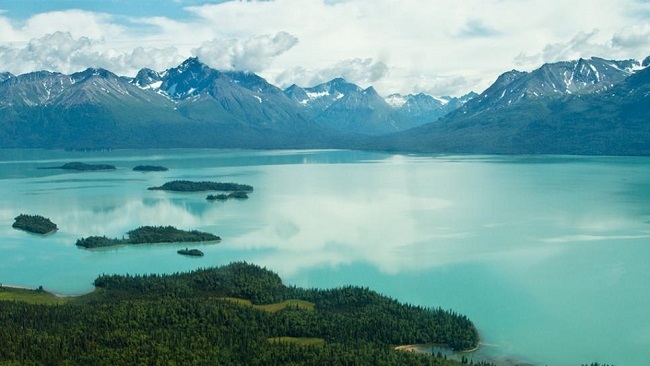 Sight-seeing, hiking, camping, backpacking, sport fishing, mountaineering, river running, flight-seeing, bird and wildlife watching, lake kayaking, photography, and hunting in the preserve are activities that you can do in the Lake Clark National Park and Preserve. There are no developed campgrounds in the Lake Clark National Park and Preserve. There is one designated camping area in Port Alsworth. No admission or user fees for non-commercial users. Lake Clark National Park and Preserve offer anglers plenty of opportunities to find trophy fish. An Alaska fishing license is required and state regulations and seasons apply. Food service is usually available associated with lodging facilities. There is one cafe in Port Alsworth. It is open from 15 May through October. Groceries and camping supplies are not available within the park. Fishing licenses, fishing gear, and fuel may be available locally. There are no roads in the park. One two to three mile trail to Tanalian Falls and Kontrashibuna Lake is accessible from the town of Port Alsworth. The 50 mile Telaquana Trail depicted on maps is an undeveloped historic route from Lake Clark to Telaquana Lake. Sport hunting is allowed in the preserve only. Alaska state license is required and should be purchased prior to departure to the park. Licensed guides and outfitters are available. June through August temperatures average between 50 F and 65 F with considerable precipitation. Weather conditions in the region change suddenly and proper equipment, rain and cool weather gear, extra food, and extra cooking fuel, are essential for any back country travel. Frost and snow can occur in September and October, and in mid-summer evening frost should be expected. Strong winds can occur at any time. Winter temperatures can sink to -40 F.